The thing about violinist and violin-teacher David-Porter is that he draws me into my dis-comfort zone, relentlessly, every lesson. My job as a student is to go home and spend the week turning that dis-comfort zone into a comfort zone. No tears allowed. And as my goal is to learn to play violin, we wouldn’t want it any other way. Progress is tacitly acknowledged. The real teaching comes from his weaving his way through the labyrinth of my ineptitude, showing me the sights and providing musical guidance as we go. Always prodding, always pushing, David-Porter isn’t interested in producing mediocre violinists, and it takes a certain kind of stamina to stand for his weekly challenge. Lately we’ve been working on bowing techniques and the various colors they produce. David-Porter exudes a trust that, with time, I will master these techniques and their subtleties; that, as breath and vocal cords learn to automatically produce expressive language, so will my breath and arm learn to do for music. This trust gives me confidence to toil forward weekly, violin in tow. If you want to push yourself and maximize your ability, it helps to seek out an elite-violinist and teacher like David-Porter. The higher the level a musician works at and continuously pursues, the more highly their hearing and expressive ability is developed over the decades of a career; and if such violinist cares deeply about the process of translating and providing this information for those lower down the chain, then you have a great teacher uncanny at drawing the best from their students. David-Porter is one such. Learning violin takes joy in knowing accomplishment. 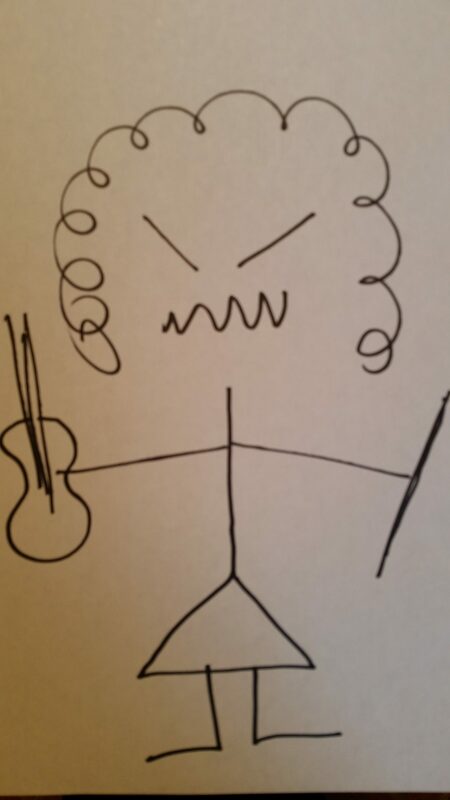 Not a lot about studying violin frustrates me. I could think of only three things. Mostly, I can’t do anything about them, except introspect, and keep plugging away. I get frustrated by life interfering with practice time. When a flat tire 200-miles from home wipes out Saturday’s practice, solving the tire problem wipes out Sunday’s practice, a car oil leak wipes out Monday’s practice, a sick relative wipes Tuesday’s practice, a last-minute trip to the doctor wipes Wednesday’s practice, and all I am left with is Thursday and Friday to prepare for Friday’s lesson, this is frustrating. I think of the child whose path is cleared for practice every day, and oh how I wish someone would do this for me. Oh well! It is the adult responsibilities of life that interfere with adult learners’ progress. I get frustrated by my own failure to trust the process of practice. I have a tendency to over-focus and work beyond the daily crest of improvement; to grind my way down the path of deterioration, deaf to consequences. I forget to stop on the upswing, allowing 10 repetitions to be enough. The body and mind need a night’s rest to assimilate the day’s work and create a launch pad for the next practice. 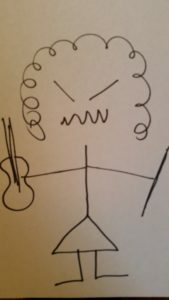 It’s a personality trait that violin demands I address. Occasionally, I get frustrated by slow progress. I know of some who learn rapidly, and feel tinges of jealousy. Not that I can do anything about this. We are each blessed with unique characteristics that provide each with unique strengths and weaknesses. As much as I might wish otherwise, my neural-makeup is slow to change and grow, particularly regarding fingers that continually trip-up and sight-reading that continually stalls-out. I can only count my blessings that, with effort, and one synapse at a time, it does evolve, if I just keep plugging away. The orchestra tunes. The conductor enters. He takes the podium. The audience settles. The baton raises. Quiet. More quiet. Energy gathers into the conductor’s focus as it trains right. A lone instrumentalist reflects the beam. And poom, paum paoum, pom, declares the timpanist. The beats cascade through the hall the winds on their tail and so is Beethoven’s violin concerto borne again. Was it magic? Was it electric? Was it joy, beauty, solace? It was all of these. It was just the three of us: Thierry and Eric and me. And it was everyone else, too. An orchestra of musicians on the stage, and over a thousand souls in the audience. It was a moment to convene, to be one sound, to feel one beat, our miscellany of being, as one. How did it happen? It is actually a highly calculated, highly prepared event. Music emerges from silence and Maestro Thierry Fischer has honed his body language to command this from the audience. 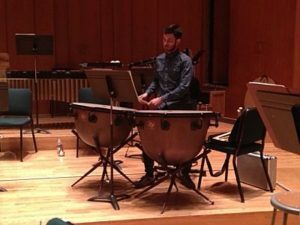 In rehearsal, also non-verbally, Timpanist Eric Hopkins has understood that his four notes need to sound even, not rushed, yet moving forward and with energy. These ideas come from Fischer’s imagination, having deeply studied the score. Eric arrives first on stage, with colleagues, selects his mallets, tunes, and sits quietly waiting for Thierry. Head bent, Thierry creates quiet, and looks up to Eric. Eric acknowledges Thierry with a smile and eye contact saying “Things are OK. I’m ready,” and centers his mallets on the instruments. The conductor’s internal tempo begins to tick, the baton is raised, the beat falls, and Eric responds: momentum and energy. The magic moment comes on beat five as woodwinds enter, when everyone lands together in time and tone. The orchestra is a body in synch, producing a soundscape blossoming from nothing, except ideas translated into physical activity: a laser sparked and we are all in. Magic: Thierry and Eric and You. Inadequacy. A horrible feeling. Yet I embrace it, in my violin life at least. When I feel good about my practice and playing, I get complacent and progress ceases. When I feel inadequate, that my sound and music could better express what I have to convey, then I look deeper and try harder to improve my technique, developing physical ability that connects to inner musical ideas. It’s a difficult road and a long slog. Luckily, inadequacy is accompanied by joy. Every step forward, however miniscule, is a step closer to that elusive goal. I pair these feelings, allowing inadequacy to propel me forward in my daily work, allowing joy to celebrate accomplishment, but wallowing in neither. Getting lost either in self-pity or in self-congratulations are death to the violinist, in that the emotional self-indulgence distracts from the labor of forward momentum. If I could describe my inner neurology, I would catalogue the insufficient neural connection between my sight and hearing to my left hand. I can read and hear melody, however my left hand is ever-so-slow to finger the idea and stumbles piteously along the way. When my left hand is getting a melody, it commandeers all available neurons such that my bow-arm lacks guidance and sound quality deteriorates to crunch, crunch. The good news is that the more I diligently and thoughtfully practice, the more the more connected and coordinated my left hand becomes, freeing neurons to direct my right arm to produce beautiful tone and expressive sound. The better news is that is that advances in the neurological sciences detail how the adult brain is far more plastic and open to growth than previously believed. We are so used to, and so taken with, the easy growth and advancement that accompanies childhood learning, that adult learning tends to get discounted. What I am discovering is that adult learning happens in a different way than childhood learning, but that it does happen. This idea serves as a foundation for aspirational goals that I cling to, worshiping at the alter of mastering skill through developing my inner neurology. One dendrite, one synapse at a time.